Did you think the same thing when you read the title of this blog? Don’t rule out this white, nutrient-dense vegetable just yet! It has multiple benefits in bettering our overall health include fighting cancer, boosting heart/brain health, detoxification and anti-inflammatory properties. Not to mention being loaded with multiple vitamins and minerals. 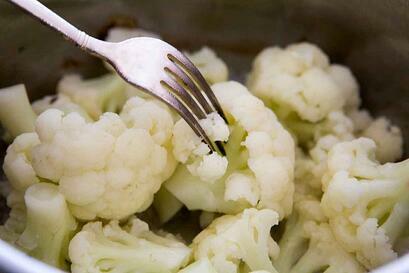 Cauliflower is a great alternative to consider when you are trying to lower your carbohydrate or calorie intake. Carbohydrates can have two important purposes: they may either be used for immediate energy or they may be stored in the liver and muscle as glycogen. If we are saturating our bodies primarily with carbs, or consuming more calories than we burn off, this means that the glycogen in our liver will be converted and stored into fat for long-term use. Since carbs make up the bulk of the American diet (think pizza, pasta, bread), this could easily be used to explain the obesity epidemic across America. Lots of us are not only eating TOO MANY carbs (portion sizes anyone? ), but we are also making TOO MANY unhealthy eating decisions when it comes to our carbohydrate choices. As some might know, carbohydrates can be high in calories; and excess carbohydrate consumption, or any excess macronutrient intake for that matter, can lead to progressive weight gain over time. So how can we help ourselves in finding ways to better our health and reach our goals? By making smarter food decisions! Lets look at an example. 100g of white rice packs 130 calories, 100g of cauliflower only has a mere 25 calories! Watching our calorie count as well as what types of foods we are putting into our bodies, can help with you reach your health and fitness goals. Cauliflower Rice has been all the rage lately but this cauliflower biscuit recipe is one of my all time favorites. The recipe is quite simple and is a courtesy of Cooking Light. Try it out the next time you're meal prepping or need to increase your healthy carb intake! Step 2: Mix Transfer mashed cauliflower into a large mixing bowl. Add in two whole eggs, cheddar cheese, Nonfat Greek yogurt, salt and pepper and mix together. In a separate bowl, beat egg whites until stiff. Then, slowly fold the egg whites into the cauliflower mixture.